If you already have Studio One Pro version 1 and want to upgrade to Professional 2, this is for you. 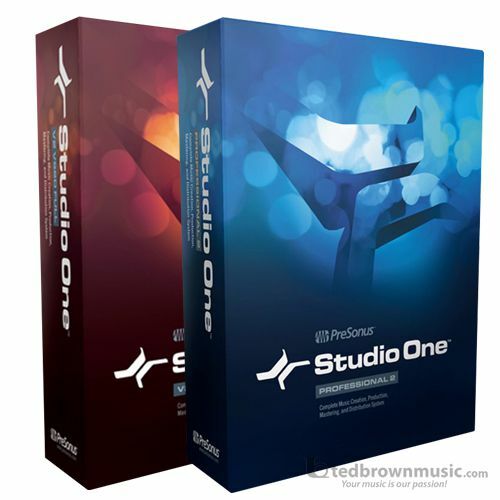 Studio One Professional is a complete, no-holds-barred production tool that pulls out all the stops and enables you to run completely amok (musically). Professional gives you a 64-bit double-precision audio engine for superior sound quality and lets you work to QuickTime video. Be the master manipulator of pitch, thanks to the included Melodyne Essential (licensed, not a demo). Your mixes take on a professional sheen after being treated by the premium plug-ins Professional adds: Multiband Dynamics (more than just compression), Open AIR convolution reverb, Pipeline for integrating outboard processors, the endlessly awesome Groove Delay, and IR Maker, which enables you to create your own impulse responses for Open AIR and Ampire XT. To the content included with other versions, we add Native Instruments Komplete Elements library, with more than 3 GB of samples and sounds we think you'll find entertaining. When your mixes are done, Studio One Professional kicks things up another gear. The Project page is Studio One's unique mastering solution, armed with versatile metering and processing options, and seamless integration between mixing and mastering environments, an exclusive PreSonus innovation. The Project page also offers extensive variety in output formats, adding automatic uploading to Nimbit® and SoundCloudTM; Red Book CD burning, disk images, the DDP professional duplication format, and individual files for downloading, to the five file formats available for exporting mixes. With its complete set of tools, Studio One Professional lets you go from recording your first riff to final release and sale of your finished music without ever leaving the program. No other DAW can do all this. This product is received by electronic download. Upon receipt, you will be given a code to proceed downloading the product.